If you are like me and have emails popping into your account on a regular basis throughout the day, it can quickly take over and before you are able to deal with the situation, you have so many emails sitting in your inbox that you really don’t know what to do or how to turn the situation around. It is difficult and sometimes time-consuming, depending on the amount of emails you have just sitting there waiting for you to read them and to decide their fate. There has to come a point where you just realize that the situation which you are dealing with, concerning your email, that you know something has to change before your inbox takes the next step into total chaos. How you deal with your inbox is personal and it has to fall in line with how you work, there is little point setting up a system that you know won’t work for you. Silvia Killingsworth wrote about her inbox in an article called ‘Zero Dark Inbox’ about the principal of getting her inbox down to zero, as per the concept devised by Merlin Mann, the founder of 43 Folders, to get the inbox to zero. However, Deborah Sweeny took the concept of the Zero Dark Inbox and questioned the need for an inbox to actually get as low as zero, even though she doesn’t aim as low as zero, she finds 50 a more acceptable number to aim for, in her article ‘Skip ‘Inbox Zero’: 5 Easy Organization Tips For Your Email Inbox’. Unfortunately, for many people these key points are just not enough to take control of their inbox. I have many sub-folders in my inbox and while they work great in some instances I have to move the items to their folder, this takes time, and sometimes it isn’t possible. I know that you can set up systems where you can set up a set of instructions to send emails directly into certain folders, for me this just doesn’t work. I have too many folders; I just can’t train myself to not only look at my inbox but to keep an eye on other folders as well, in case a new email arrives. What I need to do and what I have started doing is noting any emails that are coming in that I no-longer want or enjoy reading, I don’t hit the junk mail button because this just causes another problem in another list, I unsubscribe from the list. This makes it a solution and not just moving the problem with emails I no longer want. Those emails I do want to keep, they might have important information, file into an appropriate category, but I don’t need to keep things for years and years and never read again. I have to include a clear out session into my schedule to get rid of the old stuff. This doesn’t mean that I am putting off a decision, but if I haven’t referred to it and it is not a document that I need to keep I have to question myself, why am I keeping it? What I have not done is to tackle this in one or two sessions, I am just doing a little bit each day, keeping on top of the current emails and going through some of the older ones to start taking back control. Those emails that need action, if immediate or you can scheduled for a later date, move to an action file and a note inserted into my diary to ensure that I don’t forget the task. If you have, many emails that seem to require the same answer most email providers allows you to set up a template that answers the question and it just means a click of the button rather than writing it out again. This isn’t something I have ventured into, I still have yet to set up my signature on my email, but it is something that is on my to-do list in the future. 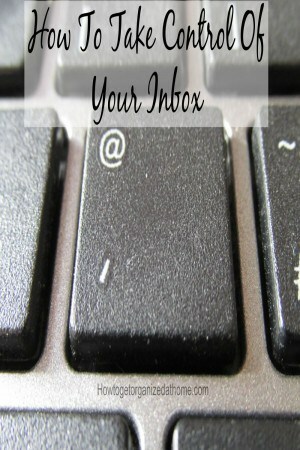 One of the most important tasks, which I am actively engaging in, is learning my email system. I want the best service and sometimes it is the tweaks that you can make which will improve your experience. Instead of just assuming, I am constantly looking to improve my knowledge in different areas, so I am fully aware of the capabilities and not just sitting there hoping it will work. To educate myself on the system I use, to learn the functions and see if there are tools that I can use to improve my email inbox experience. Will my inbox get down to zero? Probably not, but when I have the system all taken care of and in place, it should certainly save the time and the frustration that I am currently faced with on a daily basis. Therefore, while I know that creating order in my inbox is an ongoing process of discovery, it is something that I must fit into my schedule, it isn’t something to squeeze in. You must actually plan email time into your day to ensure that you are in control of your inbox, finally. If you are looking for more articles on this topic head over to the landing page where you will find more articles on organizing. Sharon, I’m dealing with this right now! !